A chemical peel is a beauty treatment that is as old as time. Ancient Egyptians and Romans used this method to keep their skin looking fresh and young. Of course, the list of ingredients in chemical peels has changed over time, but it only made them even more effective, securing their position as one of the most popular non-invasive skin treatments that bring amazing results in a short amount of time. If you are looking for a clinic that offers chemical peels for the face in Las Vegas, you have come to the right place. Iuventus medical center has some of the best aestheticians in Nevada in its staff. Make an appointment with one of our top specialists today to get rid acne, scars, wrinkles, pigmentation, and give your skin the healthy glow it deserves! What is the use of chemical peels in dermatology? This is the mildest and the most popular chemical peels for face, hands, and neck today. 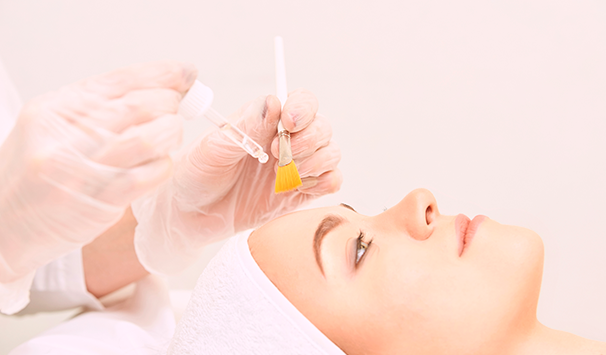 In this case, an esthetician uses glycolic or salicylic acid on the area being treated. This type of peel is usually well-tolerated which is why it is also known as the “lunchtime peel”, meaning that it requires zero downtime and causes only mild redness. It is good for reducing pigmentation and exfoliating dry skin as well as removing small lesions. With superficial peels, it is the consistency that counts the most. You need to repeat the procedure 2-3 times to see a significant improvement. These are great chemical peels for wrinkles, acne scars, blotchy pigmentation, sunspots, and freckles. For this type of peels, trichloroacetic acid is usually used. Medium peels require 1-2 weeks to recover. Expect that the affected area will be red, swollen, and crusted for at least a week. This type of chemical peel for the face can be quite painful, so it is usually performed under light sedation. 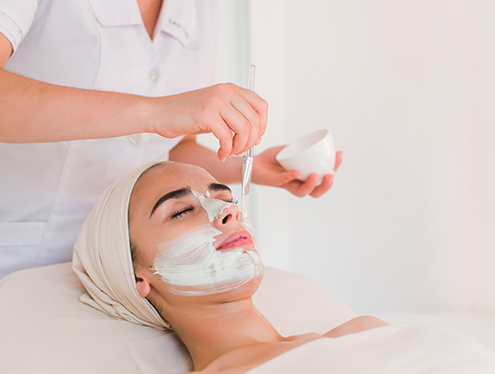 In severe cases, an aesthetician may recommend a deep chemical peel with phenol, but it is rarely used these days due to high risks of scarring and because of phenol toxicity. Step 1: Your face is washed thoroughly to get rid of makeup, dirt, and oil. Step 2: A barrier ointment is applied to the skin around the lips, eyes, and nose to protect it from acid. Step 3: The peeling solution is applied to the desired area and left for several minutes. Step 4: Another agent is applied to neutralize the acid. Step 5: The remains of the peel are washed off the face. If you want to find out more information on the chemical peels cost or have any questions about the procedure itself, don’t hesitate to contact our medical center. We work Monday-Friday 9 am to 5 pm, and Saturdays 8 am to 12 pm.